It is very common for MS Word documents contain sensitive information. Maybe you record your personal data such as bank information in it. Or, perhaps it contains your business data. Anyway, you will prefer to protect your confidential data from spying eyes. Creating a password is a featured function in Word program which is able to keep your documents safe from those unauthorized access. Tips: If you have already known how to create Word password, directly go to Part II to see the directions on Word password remover. The processes for creating Word password are a bit different depending on the version of it. Here we take Word 2007 for example. Step 1: Open the Word document you would like to add a password to. Step 2: Click “Microsoft Office Button” and select “Save as”->“Word Document”. Step 3: In the Window of “Save as”, specify the location of your file. At the bottom of left corner, click on “Tools” and select “General Options”. Step 4: You may now set a password under either “Password to open” box or “Password to modify” box or set passwords for both. Step 5: Click “OK” to confirm your changes and save your document as usual. Declare: This information is strictly shared to help you to gain access to your own Word document that you have lost or forgotten the password for. After you create a password for your Word file, you don’t need to worry about security issue. But the troubles comes accidently, you forgot it. Not like Windows system password, Microsoft doesn’t empower you to retrieve Word password with built-in features. It is a bit hard to recover Word document unless you utilize Word Password Remover software. Below are the easy steps on how to remove Word Password. 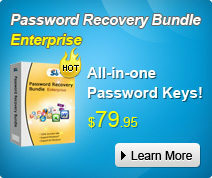 Step 1: Launch Word Password Recovery and you will enter the user-friendly interface. Step 2: Import password-encrypted Word document by clicking on “Open” and selecting the file on your PC. Step 3: Choose “100% instant document decryption” which is recommended because it is the fastest and most efficient mode for Word password attacking. Click “Next”. Step 4: Click on “Document Decryption” to initiate the recovery. After the recovery, a newly fixed file will be generated in the folder where your source file locates. Done! You have removed Word password successfully. How to recover Word password ? Word Password Recovery! Word Password Reset! Word Password Retrieve! In most companies’ offices, *.doc (Microsoft Word) documents are probably the most widely-spread files used by employee. To protect the information, users often set a password for *.doc files. This is a convenient way to restrict access to the file when users exchanged and store information. The problem appears when you forget or when an employee who set the password leaves the job and the password isn’t recorded anywhere. If this happens, how do you get out of the situation? Well, as far as I know, there is a lot of software can recover word password, and they focuses on recovering Word password with three attack modes, Brute-force Attack, Brute-force with Mask Attack and Dictionary Attack. Brute-force Attack for passwords with nothing know on the password, it means the program will do a full-scale search and try all possibilities randomly in order to get the password guess with the correct password and recover it. Brute-force Attack with Mask Attack is commonly used when some password features are still remembered. For instances, the possible password length, any digits, letters, special characters like pond, dollar, or asterisk in the password. What are the first or last characters of the password, etc. This allows users to define a password mask to minimize the guess test load and maximize the recovery speed. You can choose this attack if you still remember part of your password. For example, if you still remember your password is four characters and begins with “z”, then you can define the mask as “z?? ?” Thus reduces the detecting scale for the program, as it will only seek for the last 3 characters instead of 4 characters of the whole. To use this attack, a password mask must be defined. Dictionary attack allowed you to create your own dictionary for the program to base on Brute-force with mask attack helps to reduce the password search time. 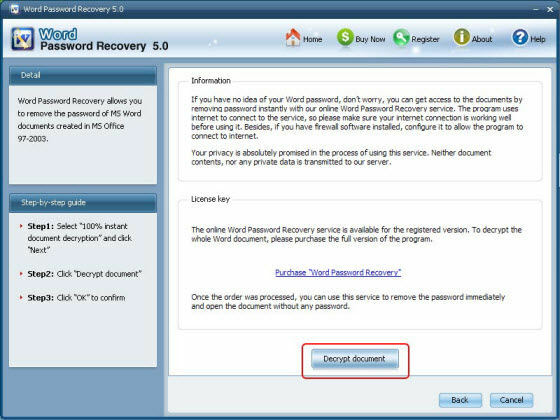 In order to offer you the best software, I have tried all password recovery tools I can found, and according to my experience, I recommend you Word Password Recovery 5.0 your best choice to retrieve word password. 5. Support for simultaneous processing of several password recovery projects. Several attacks (using different attack profiles) can be conducted on one file simultaneously. Step1: Click “File>Open” in the Menu or the “Open” button to browse in the Word document. Step3: Click “Start” button in the Menu to initiate the program. Step4: The program is searching the password. Some time later, a message box pops up to you, displaying the expected password. Click “Remove All Passwords from the File” to remove all passwords (Password to Open and Password to Edit) from the file. Click “OK”. 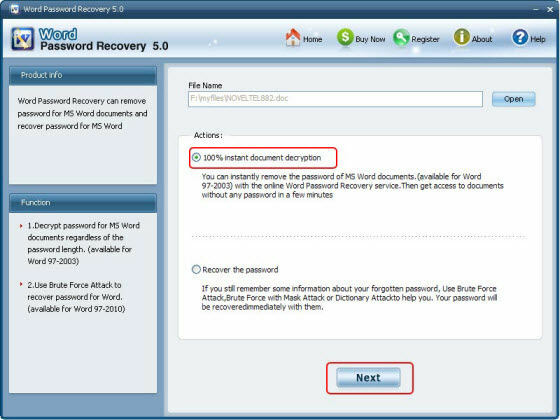 Word Password Recovery 5.0 can be downloaded on it official website. By the way, there is a tool there called Password Recovery Bundle which including not only Word Password recovery 5.0 but also other programs that can recover your windows password, office password as well as rar password.